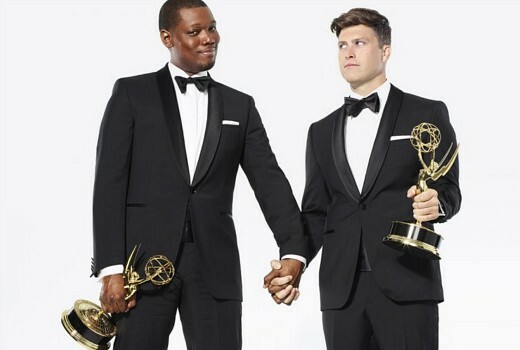 Colin Jost and Michael Che, hosts of Saturday Night Live’s ‘Weekend Update’ will host the 70th Primetime Emmy Awards. Venue: Microsoft Theater in Los Angeles. Presenters: Patricia Arquette, Alec Baldwin, Eric Bana, Angela Bassett, Samantha Bee, Bobby Berk, Connie Britton, Rachel Brosnahan, Karamo Brown, Millie Bobby Brown, Benicio del Toro, Michael Douglas, Tina Fey, Claire Foy, Tan France, Hannah Gadsby, Ilana Glazer, Kit Harington, Taraji P. Henson, Abbi Jacobson, Jimmy Kimmel, Kate McKinnon, Tracy Morgan, Elisabeth Moss, Bob Odenkirk, Sandra Oh, Sarah Paulson, Antoni Porowski, Issa Rae, RuPaul, Andy Samberg, Matt Smith, Ben Stiller, Jonathan Van Ness, Constance Wu.